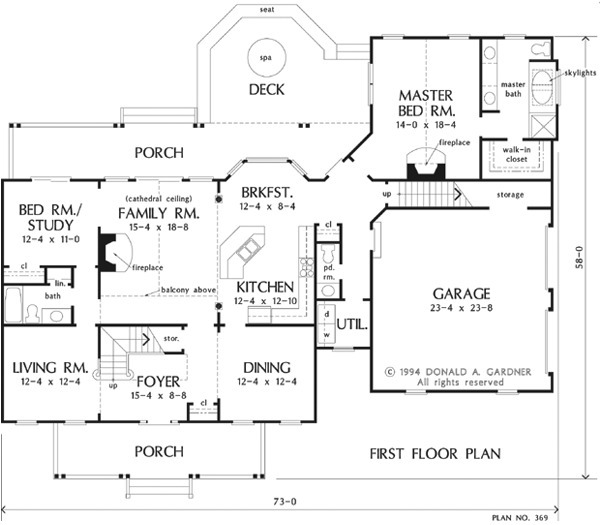 This open, elegant plan gives equal attention to both private and formal spaces. The central foyer gives a glimpse of both the formal dining room and living room. The two-story family room, with circle-top window over French doors leading to the covered porch and deck beyond, is a warm gathering place open to the island kitchen and breakfast bay. The master suite has every coveted feature: vaulted ceiling, fireplace, and skylit bath with whirlpool tub, double lavs, and separate shower. 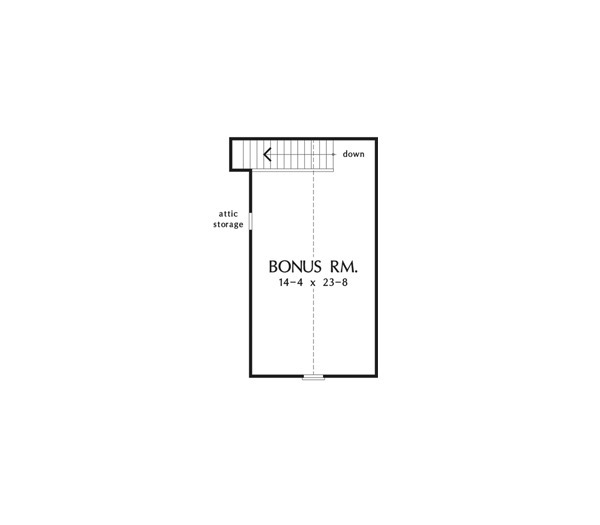 Bonus room and plentiful attic storage are an added plus. 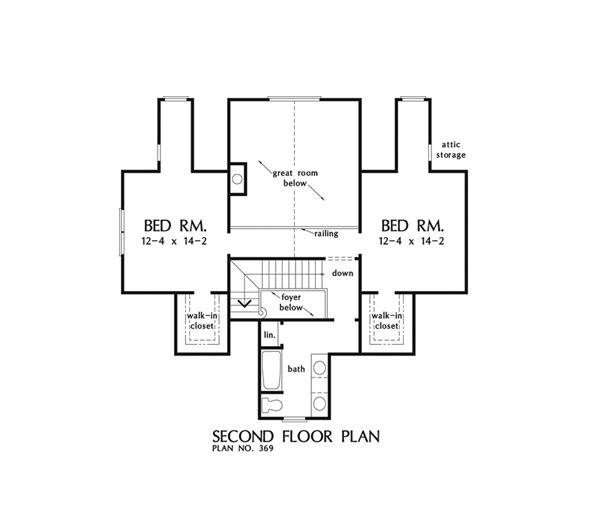 1st Floor: 1998 Sq. 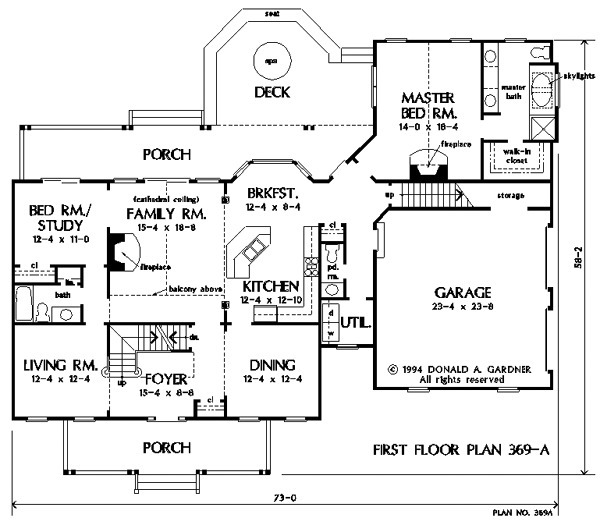 Ft.
House Dimensions: 73' 0" x 58' 0"
Master Bedroom: 14' 0" x 18' 4"
Foyer : 15' 4" x 8' 8" x 9' 0"
Dining Room : 12' 4" x 12' 4" x 9' 0"
Great Room (Cathedral): 15' 4" x 18' 8" x 19' 10"
Kitchen : 12' 4" x 12' 10" x 9' 0"
Breakfast Room : 12' 4" x 8' 4" x 9' 0"
Bonus Room : 14' 4" x 23' 8" x 9' 0"
Master Bedroom (Cathedral): 14' 0" x 18' 4" x 15' 4"
Bedroom #2 : 12' 4" x 14' 2" x 8' 0"
Bedroom #3 : 12' 4" x 14' 2" x 8' 0"
Porch - Front : 28' 9" x 7' 4" x 0' 0"
Porch - Rear : 47' 4" x 7' 4" x 0' 0"
Deck / Patio : 22' 8" x 15' 6" x 0' 0"
Living Room : 12' 4" x 12' 4" x 9' 0"
Storage (1st Fl.) (Sloped): 17' 0" x 3' 4" x 0' 0"